Today, Nintendo announced the successor to its handheld gaming DS platform, which will include a 3D screen and debut at this years E3 expo in Los Angeles. Beyond that info, however, we don't know very much at all about the hardware powering the new device, unique input methods being introduced, or even the kind of 3D tech employed. So we did some digging through the speculation to sort out the likely rumors that may come to fruition--and thought about what we want it to do. According to the announcement, we know the 3DS will not require glasses for its 3D visual effects. While that doesn't really work right now for a home theater 3DTV setup, it makes sense on a mobile device. The DS currently has two cameras that can track the player's eyes and change the onscreen graphics to simulate 3D space. This technology is already being used on current DSi hardware so we can be pretty sure we'll see a continuation of head-tracking 3D in the 3DS. But wait, there's more: Engadget dug up a tip from Japanese news outlet Asahi, reporting that the screen will also employ 3D parallax barrier technology developed by Sharp and Hitachi. Parallax barrier tech is one of the autostereoscopic options vying for consumer adoption and marketplace supremacy. It works by by placing a barrier in front of the LCD screen that functions similarly to 3D polarized glasses by filtering separate images to each eye. With a parallax barrier, you're basically making your device wear the glasses instead of you. The problem with this technology is you have to be viewing from a specific angle in order get the 3D effect, but on a mobile gaming device you'll always be 6 to 18 inches from the machine and your viewing angle will usually be a straight line from the screen to your eyes. The controlled nature of handheld gaming means no-glasses 3D could be super effective on the Nintendo 3DS. 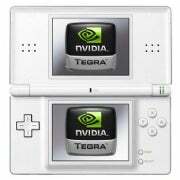 It has been rumored for some time that the DS successor will be sporting a Tegra chip under the hood--the same chip that powers Microsoft's Zune, many Android tablets, and some low-power laptops. Tegra chips are unique because they include a variety of processing cores each dedicated to a particular task such as graphics processing, sound processing, video decoding, and so on. This suggests the 3DS may have a vast amount of applications outside of traditional gaming. For example, there have been many rumors going around that Netflix may be coming to the Nintendo DS. Well, if the Nintendo 3DS has a chip that can play 1080p video, that rumor starts to make a lot more sense--and a native Netflix app at launch could attract a much larger crowd than a games-only device. The DS was the first successful gaming device that focused on a touch interface. This was revolutionary back in 2004 when it launched, setting a precedent for smartphones such as the iPhone to develop fun and intuitive touch screen games. In order to continue that success, the 3DS will have to both adapt to current trends and develop its own in the process. For starters, an accelerometer is practically guaranteed on the 3DS. Ubiquitous on smartphones and popularized by the Wii, accelerometer-based motion controls even appeared on the original Nintendo DS through the use of an add-on device. What else can we expect? Engadget is reporting that a 3D control stick and vibration may be on the way as well. The control stick may be reminiscent of the PSP's analog nub, and the vibration similar to haptic touch on smartphones, but neither feature is particularly groundbreaking. However, a few months ago we reported on new pressure-sensitive touch technology that can add a sense of depth to touch-based devices--technology that Nintendo's display supplier has licensed [Engadget] for a device coming out as soon as April. Hmmm. Even if the pressure-sensitive feature doesn't make it, I still hope Nintendo ditches the stylus for a finger friendly capacitive touch screen. There have been rumors that the 3DS will include a high-res screen that trounces the original's measly 256x192 resolution. A higher resolution is to be expected but how high Nintendo will go remains to be seen. Though HD quality might not matter for a handheld, I'd feel better about buying a 3DS if it could at least display 720p video. The other big rumor thrown about is that Nintendo may consider an always-on 3G data connection [Kotaku] for the 3DS. I'm not going to debate the validity of that rumor here. There's too many things to consider such as varying data coverage in different parts of the world, as well as the cost associated with such a device. However, I would like to ask of Nintendo one thing that comes with most 3G devices: an app store. Nintendo has messed around with the idea of apps with DSiWare games as well as the Wii virtual console shop. Open up that platform to the public and release an SDK for homebrew developers to create their own apps and games. Make sure all 3DS games can be purchased and downloaded directly to the console so we don't have to deal with brick-and-mortar stores. An app store will create a healthier ecosystem around around your device and encourage use outside of game-only applications. If Nintendo added significant internal storage, people would be more inclined to use the 3DS for apps and digital downloads--perhaps enough to avoid a smartphone altogether and stick with a 3DS for their mobile computing needs. E3 is just a few months away where we'll go to see if these questions can find some answers. In case your wildest dreams for the 3DS don't come true, try and cheer up. Nintendo's iterative hardware track record indicates that the 3DS-2 is just around the corner. Follow GeekTech on Twitter or Facebook, and check out Game On for more gaming news from PCWorld.